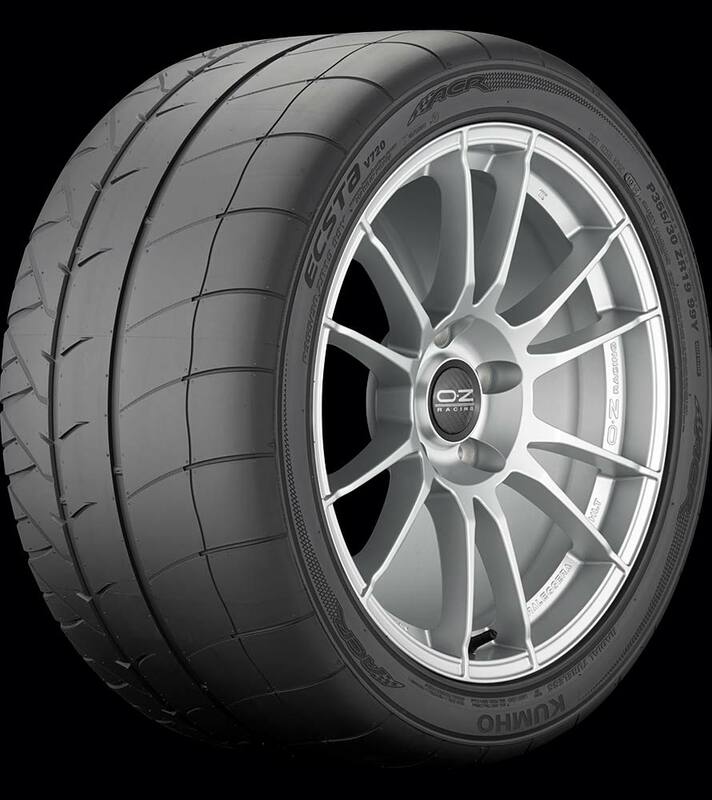 The Ecsta V720 ACR is Kumho's Streetable Track & Competition tire originally developed in the 295/25R19 90Y (front) and 355/30R19 99Y (rear) sizes as Original Equipment on the 2016 Dodge Viper ACR (American Club Racing) — the fastest street-legal Viper track car ever. Designed for driving enthusiasts looking for ultimate performance on dry pavement, the Viper ACR's Kumho tires, refined suspension and Extreme Aero package (developing nearly one ton of downforce at the vehicle's top speed) are said to be capable of delivering sustainable 1.5 g cornering forces in high-speed turns. Like all Streetable Track & Competition tires, the Ecsta V720 ACR is not intended to be serviced, stored nor driven in near- or below-freezing temperatures, through snow or on ice. Ecsta V720 ACR tires mold Kumho's super high-grip synthetic resin and ultra-fine carbon black enhanced tread compound into an asymmetric design that begins just 6/32" deep. Massive outboard shoulders deliver dry road responsiveness and cornering. Many of the lateral tread design features are very shallow in depth, resulting in a virtual slick tread design early in the tire's life. Warning: Ecsta V720 ACR radials meet DOT requirements, however they are not recommended for driving in wet conditions where standing water is present and there is the risk of hydroplaning; drivers should drive cautiously at significantly reduced speeds if they encounter these conditions. This is especially true of worn tires. The tire's casing was developed using Kumho's ESCOT tension control optimization technology that allows engineers to tune the bead, sidewall and shoulder rigidity to optimize footprint pressure distribution and uniformity. This results in less flexing and cooler operating temperatures that improve durability. The tire's internal structure includes dual high-tensile steel belts reinforced by spirally wound nylon to provide excellent strength and high-speed capability while the sidewalls are tuned to resist lateral deflection and to provide handling control and positive feedback.